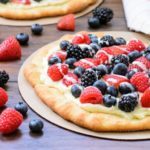 A recipe for a summer berry pizza topped with mascarpone cheese and fresh summer berries; strawberries, blueberries, raspberries, and blackberries. Place a pizza stone on the bottom oven rack. * Preheat oven to 425 degrees F.
If making smaller pizzas, divide the dough into 4 equal pieces. Roll, stretch, or pat out the dough to about 1/4-inch thickness on a rimless sheet or pizza peel lightly dusted with cornmeal or flour. Brush the dough with melted butter. Transfer the crust to the stone and bake until golden brown, about 7 minutes. Cool baked crust completely on a wire rack. Stir together the mascarpone cheese, lemon juice, and honey in a bowl. Spread cheese mixture over the cooled crust. Top with berries. Stir together confectioners sugar, vanilla, and enough milk for a drizzling consistency. *If you do not have a pizza stone, you can bake the crust on a baking sheet lined with parchment or non-stick liner.